WHAT EQUIPMENT TO CHOOSE FOR CHIP TUNING? In this article we analyze the merits and defects of the most established brands in this sector. Let’s see the differences between the best products for remapping units via the diagnostic port and to the bank. FGTECH is the only all-in-one product, one tool allows programming on the bench and via OBD socket. 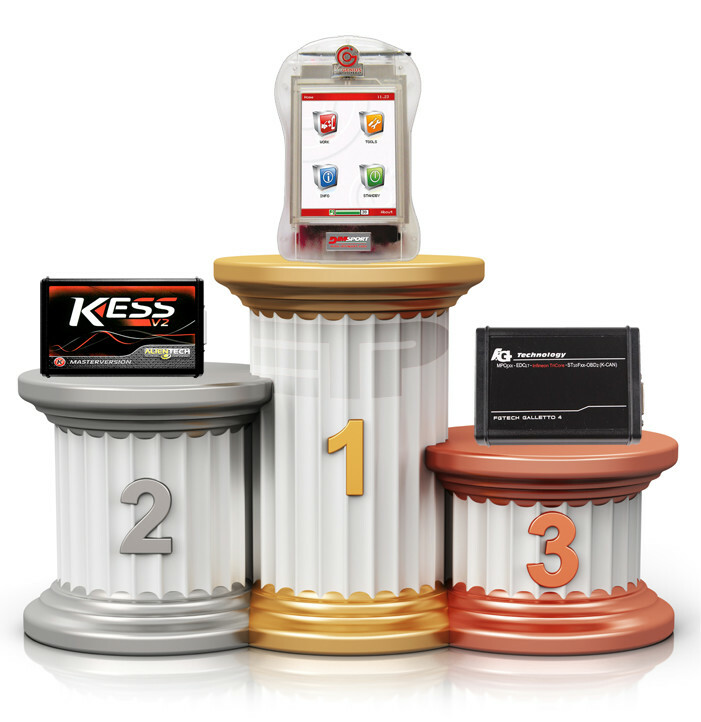 Kess and New Genius only work via OBD socket, so they need to be matched to their big brothers to work at the bench, and offer full coverage of the car group that can be compared to EOBD2 FGTech. Then they will be added to Ktag and New Trasdata. Alientech and Dimsport get the highest rating because their car list is higher. FGTECH gets the lowest rating because they lack some protocols that are present in the competition. FgTech gets the highest rating, the price of their product complete with all is 5,000€. Alientech get the interim evaluation, the price of Kess + Ktag is around 8000-9000€. Dimsport gets the lowest rating, the price of New Genius + New Trasdata is around 11,000 -12,000€. FgTech gets the lowest rating, the service is almost nonexistent. Alientech obtains the interim evaluation, the assistance is superior to that of FgTech but lower than that of Dimsport. Dimsport gets the highest rating, the service is nearly flawless. FgTech gets the lowest rating, the software is complicated and provides connection to the internet during the writing phase. Alientech get the interim evaluation, the software is very cute and easy to use, though not performance as that of Dimsport. Dimsport gets the highest rating, the software is super accurate, includes all definitions of units and does not allow any error. It is the only one who has the file management and vehicles with a database that stores all files and all scheduled vehicles. FgTech and Alientech get the same evaluation, the software are similar, include the sending of the file readed from the slave client via email, this can be confusing, you can lose your files and you do not have an account of the planned vehicles. Dimsport gets the highest rating, the software automatically communicates with the customer, slave, sending files is automatic and not manual, the software of the master and slave contains the database of all scheduled vehicles and credit management with the customer , a system honed to perfection. Alientech gets the lowest rating, the template provided is very rudimentary, low quality and difficult to use. Does not provide the use of long test leads for the boot-mode. FgTech get the interim evaluation, not very practical accessories for use. Dimsport gets the highest rating, the bdm frame is of excellent quality, involves the use of GPT mode that allows you to program any unit without any welding, all through the use of long test leads that are anchored in holes in the Plexiglas support GPT. Dimsport gets the highest rating. Genius is the only tool that works independently, without the use of computers, as well as being seen better from a client, who does not see loose cables from the computer to the vehicle, and also much safer than others, working independently, it is not subject to the dangers caused by the interruption of the computer (the operating system crashes, power failure, USB cable disconnection). Alientech get the interim evaluation, their products use the same connection diagrams to the bench like DimSport, however, did not follow the philosophy of developing a standalone tool as the Genius. FgTech gets the lowest rating, EOBD2 is more difficult to use, provides links to the bench with the use of diodes and resistors, not like in the diagrams of the competition, and a higher number of connections to be made on the ECU, perhaps caused by the fact that this product combines two products in one, so some things must be performed by the tuner. Dimsport gets higher, the Genius evaluation working autonomously and following the instructions reduces almost to zero percent chance of doing damage, it is the surest tool ever, has many limitations because they have staked all on safety and reliability. Alientech get the interim evaluation, the Kess is quite stable but not as the Genius, even if the protocols are the same, the fact of having to use your computer to read and write, it penalizes the reliability. FgTech gets the lowest rating, the tool allows you to write data formats without any verification, so with a high possibility of doing damage. We remind users that they are using the clone that, as long as there captain car not very recent, the situation is favorable, but when you start to work on cars a bit ‘more recent, perhaps protected by RSA algorithm, the use the clone will be fatal to your ECU. The clone does not end almost never the writing phase correctly, the cost of FgTech is around three damaged units, and consider the purchase, with € 5,000 will have everything ready for occupation. We chose Dimsport, our philosophy is to spend the maximum to get the best results, we have not seen fit to save on equipment which then operate on expensive units and constantly updated. Proud to have chosen the only equipment that exists only original, no clone. The estimates used in this ranking was derived from our personal experience with these products. Soon we will update the article by adding the product of another company that is reaching excellent results.